Welcome to the curriculum page for English. Scroll down to see the Year Maps for this curriculum area. You will find external links to websites which will support your child's learning. Year One and Two English Map 2015 2016. Year Three and Four English Map 2015 2016. At Aldwyn Primary School we use a synthetics phonics programme called 'Read Write Inc' produced by Ruth Miskin. Read Write Inc is a method of learning centred around letter sounds and phonics, blending them together to read and write words and using these learnt sounds in their reading and writing. In EYFS and in KS1 children will follow a daily phonic programme to create fluent, enthusiastic readers, confident speakers and willing writers. Using Read Write Inc the children learn to read effortlessly so that they can put all their energy into comprehending what they read. It allows them to spell effortlessly so that can put their energy into composing what they write. The children are assessed and grouped according to their ability. They will work with a teacher or teaching assistant on the Read Write Inc Programme. At the end of each half term the children will be assessed again and put into new groups. 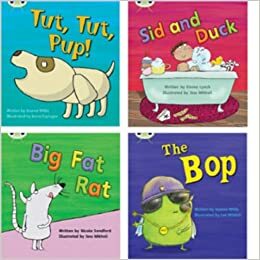 Learn how to pronounce the Set 1 and 2 Sounds for Read Write Inc.
At Aldwyn we use a variety of reading books that are motivating and enjoyable for our children enabling children to read for pleasure. We use a variety of reading schemes and real books in fiction, non fiction, poetry and plays. Our schemes are Pearson Phonic Readers, Dandelion Phonics, Rigby Star Fiction and Non Fiction, Project X, Rigby Pocket Reads and Oxford Reading Tree. Our Teaching Assistants are trained in the Better Reading Programme. This is a ten week intensive programme of three fifteen minute one-to-one sessions for pupils who have not yet met national expectations for reading for their year group, children who have not passed the Year One Phonic Check or whose progress is not at least good and need a 'boost' with reading. The programme provides a relaxed environment that gives children the time and space to practise and apply the skills taught by their classteacher. This is a special time where the children read with pleasure and enjoyment and talk about their reading with a skilled Teaching Assistant in Better Reading.